Raam-Taal party defends MK's justification of abduction, attacks IDF 'crimes against humanity,' praises terrorist release. The Arab Raam-Taal party in the Knesset held a meeting on Monday with all its members, to discuss issues related to "Palestine's Interior" (the state of Israel) and "the occupied state of Palestine" (Judea, Samaria and Gaza). The first statement declared that Jews have no right to enter the Al-Aqsa Mosque, namely the Temple Mount - the holiest site in Judaism. "The blessed Al-Aqsa Mosque is the holy property of the Muslims only," wrote the Arab MKs, who added that they oppose propositions in the Knesset to divide the site between Jews and Muslims by setting areas and times for each group's usage. 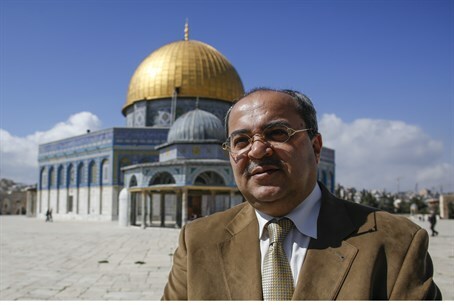 Raam-Taal MKs further called on the Muslim world at large to prevent the "Israeli occupation" from accessing the site of the First and Second Temple, going on to condemn the "Judaization" of the Temple Mount and Jerusalem, the 3,000-year-old Jewish capital. It should be noted that the Interior Committee's sub-committee on Jewish prayer rights at the Temple Mount on Monday issued a report, pushing recommendations to maintain the status quo at the Mount. MK Zevulun Kalfa attacked the recommendations as leaving the Mount in the hands of Hamas, even though they were made by members of his own Jewish Home party. In particular he noted the suggestions let leave the Jordanian Waqf (Islamic trust) with de facto rule, giving them the power to charge tourists money to visit the site. Further, the constant riotous Arab violence against Jewish visitors to the site would continue to end in a ban on entry for Jews. The Arab party came out strongly in support of Arab MK Hanin Zoabi (Balad), who sparked rage by justifying the kidnapping of the three Israeli teens by Hamas terrorists two weeks ago in a radio interview. It also decried the police recommendation to investigate Zoabi over the remarks. Raam-Taal went on to attack the IDF's Operation Brother's Keeper, to rescue the kidnapped teens and harm the Hamas terror infrastructure in Judea and Samaria. They called the IDF operations "crimes against humanity." The group condemned the re-arrest of terrorists released in the 2011 Gilad Shalit deal as part of the operation, which they termed "a blatant breach of international law." One of those terrorists was recently arrested for having murdered Chief Superintendent Baruch Mizrahi Hy''d in April. Additionally, the Arab party condemned the proposal to force feed hunger-striking jailed terrorists, and called to punish Israel for "harming Palestinian children since the year 2000." The party also called for unity among all "Palestinian groups and forces," indicating recognized terrorist groups such as Hamas and Islamic Jihad, so as to "deal with the Zionist enterprise." A final point the Arab MKs made was to celebrate the release of the jailed terrorist Wissam Khalil, expressing hope that all the prisoners "in the jail of the Israeli occupation" will soon be released. It should be noted that Khalil was charged in a regional court after confessing to aggravated arson, admitting that he threw molotov cocktails at the Galilee community of Mitzpe Netofa to cause harm to the town and its residents. Khalil also admitted to aggravated carjacking, robbery from a car and setting a car on fire, planning and attempting to abduct an IDF soldier and steal his weapon, and punching a police officer in the face while being arrested.